Ovary - Angiectasis, in a female F344/N rat from a chronic study. 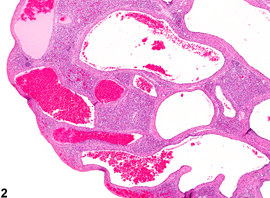 Dilated, enlarged vascular channels are present throughout the ovarian parenchyma. 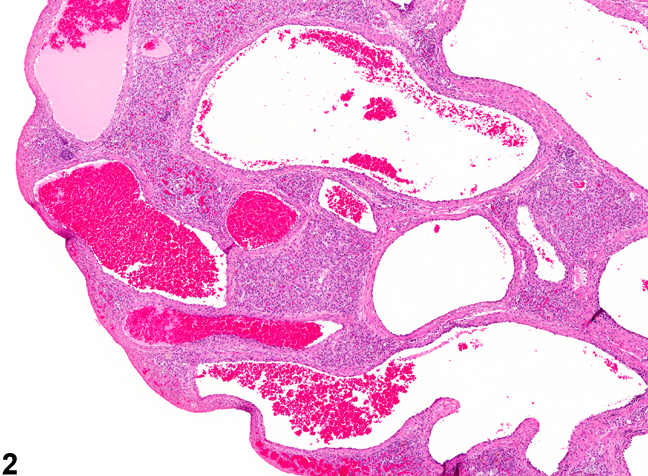 Ovary - Angiectasis in a female F344/N rat from a chronic study (higher magnification of Figure 1). Dilated, enlarged, vascular channels are present in the ovarian parenchyma, which are lined by endothelium. Angiectasis is characterized by channels of variable size and shape randomly distributed throughout the ovarian parenchyma ( Figure 1 and Figure 2 ). These channels are lined by a single layer of flattened spindle-shaped cells and generally contain variable numbers of blood cells. This occurs in the ovaries more frequently in mice than in rats. Preexisting ovarian blood vessels become dilated and filled with blood cells, accompanied by compression of the ovarian parenchyma. This is a common age-related change; however, the mechanism has not been clearly elucidated. Angiectasis must be distinguished from ovarian angiomatous hyperplasia, hemangioma, and hemangiosarcoma. In ovarian angiectasis, the number of vessels is not increased, and the endothelial cells lining the dilated vascular channels appear normal in size, shape, and number. In angiomatous hyperplasia, there is an increase in the number of vessels, but the endothelial cells are essentially normal. In hemangioma, there is an increase in the number of vascular channels with hypertrophied endothelium. 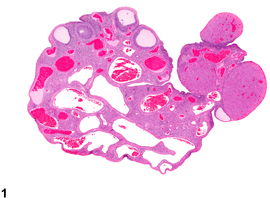 Hemangiosarcoma is characterized as a poorly delineated mass causing displacement or destruction of ovarian parenchyma, consisting of irregular, poorly formed, potentially invasive vascular channels lined by an excessive number of pleomorphic cells with generally scant cytoplasm and enlarged, oval hyperchromatic or vesicular nuclei. Ovary - Angiectasis should be diagnosed and graded whenever present. Mitsumori K. 1990. Blood and lymphatic vessels: In: Pathology of the Fischer Rat: Reference and Atlas (Boorman GA, Eustis SL, Elwell MR, Montgomery CA, MacKenzie WF, eds). Academic Press, San Diego, CA, 473-484.